• 아시아나항공 셔틀버스는 아시아나항공의 항공권 소지자에 한하여 무료로 운행됩니다. 아시아나항공의 뉴욕-인천구간(OZ221/OZ222)을 이용하시지 않는 분들은 무료셔틀버스 이용이 불가하오니 양해해 주시기 바랍니다. • 스타얼라이언스 공동운항 (UA, ANA항공 등등)으로 발권하시고, 아시아나 항공을 탑승하시는 분들은 셔틀버스 탑승이 불가하십니다. • 아시아나항공 셔틀버스는 반드시 최소 48시간 전 "사전예약"을 하셔야 이용이 가능합니다. 셔틀버스 탑승시간 48시간 전까지 "사전예약"이 되어있지 않은 승객께서는 셔틀버스 탑승이 불가 합니다. 일/월요일 탑승하시는 승객분들은 꼭! 금요일 오후 3시 이전까지 예약 하셔야만 탑승됩니다. • 아시아나항공 셔틀버스는 날씨의 영향으로 인하여 운행이 취소 또는 변경 될 수 있습니다. • 사전에 셔틀버스를 예약하신 승객께서는 날씨 변동이 심할 경우 예약하신 여행사를 통하여 운행상황을 확인해 주시기 바랍니다. • 셔틀버스는 정시 출발하며, 정해진 탑승시간까지 나오시지 않으시면 별도의 연락없이 출발하며, 차후 책임지지 않습니다. • 셔틀버스 탑승시 짐 규정은 아시아나 항공사의 규정에 의거 하며 추가로 가져가실경우 셔틀버스 탑승시 탑승 거절을 할수 있습니다. • JFK공항에서 뉴저지로 오실때는 아시아나 항공기 LANDING 후 Gate 도착시간 기준으로 1시간 30분 후에 셔틀버스는 출발합니다. • The free shuttle bus service is available only for passengers of Asiana Airlines flights OZ221 and OZ222. Boarding will be denied to passengers without an e-ticket or Asiana Airlines ticket purchase confirmation. Please note that code-share flight ticket holders may not take the shuttle bus. • Passengers who purchased airline tickets using their Star Alliance mileage (i.e. – UA, ANA, etc.) may not use the shuttle bus service due to the fact that it’s not a Asiana Airlines ticket purchase. • Asiana Airline passengers must make their reservations at least 48 hours prior to the departure time. Passengers who take wish to take the shuttle bus on Sundays or Mondays must make bus reservations by 03:00 pm on the previous Friday. • For group or family reservations, each passenger must make a reservation separately (each passenger must have an Asiana Airline ticket number and reservation code). • Passengers should check the weather forecast prior to their departure. Please be advised that the shuttle bus schedule may be modified or cancelled due to inclement or harsh weather, depending on the severity. • If bad weather is expected, they should contact their travel agents. • Please also note that the shuttle bus will always depart on time. The bus operator is not obligated to contact passengers who are late or no-shows. • The shuttle bus follows the Asiana Airlines’ baggage policy, so if passengers bring extra luggage, we may deny boarding. • Please be advised that the shuttle schedules posted for Asiana Airlines flight OZ222 passengers are for informational purpose only. 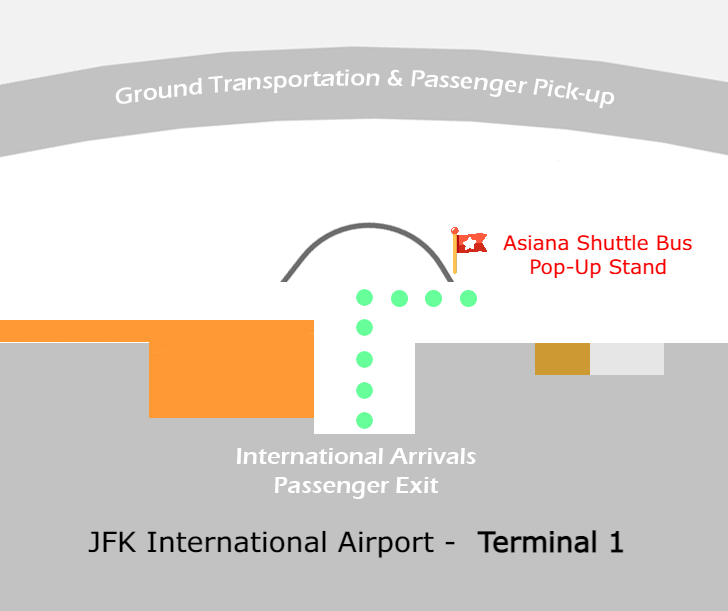 • While we make every attempt to accommodate all passengers who are confirmed, our shuttle reserves right to depart the JFK Airport Terminal 90 minutes after the arrival of Asiana Airlines flight OZ222. • A nominal gratuity or tip for the driver is greatly appreciated. The recommended amount is $5.00 per passenger. ※셔틀버스는 #222편 아시아나 항공기 Gate 도착 후 1시간 30분 후에 출발합니다. ※The shuttle bus will leave approximately 1 hour 30 minutes after Asiana Airlines Flight #222 arrives at the gate.